Made a nice bit of coin at a gig last week, so I spent some of it and treated myself to a new toy. Even after only a little over 24hrs, I am really loving this little unit. I’ve been embedded in Reason so long for all my music production that it’s refreshing to take a step back and just use a portable dedicated device like this for a bit. A lot of my production gets kind of multi-layered and intricate in Reason just because I can, but I’m already enjoying the more streamlined dedicated production experience on the Circuit. What a great palette cleanser. Novation really nailed something special here, especially for the price, and I started making music right away with very little manual reference. Being able to customize synth patches and samples in an editor application is pretty darned great too. Little wishlists? Maybe a master compressor, and more memory for longer samples. But the bang for the buck here is outstanding, so I feel like I’m being overly greedy by asking for more. With the right samples and synth sounds, I’m starting to feel like I could put together a house set in a pinch with the Circuit. Anyone else having a fun time with this little unit? Just picked one up myself! One of those things where I noodle with it for five minutes at the music store, feel hugely inspired by its design, and have to take it home. Now I really need to learn some of the details about it. My first attempts were just creating and layering basic beats and synth parts with stock sound packs, but now I’m digging in and getting into synth patch design, uploading my own sample sets, and there are some really cool tricks in the updated firmware like sample flipping where you can mix and match any of the 64 loaded samples in a pattern, or non-sequential pattern chaining to create full songs. Of course messing with this is keeping me from completing my updated Reason live rig, but I think I’m getting some value out of the Circuit in terms of giving my brain a break with a different workflow and a different kind of inspiring music making process. I’ll be curious to know what you think after you’ve had a chance to dig in. I'd been looking for a drum machine, or drum-machine-adjacent machine, for a little while now. It's for live/real-time tinkering and inspiration, so I'm always happy to have some in-the-box options when it comes to effects, stereo samples, etc. I had been considering something like the new DrumBrute but it's mono out, has no effects, and you're stuck with the one sound you have per channel. So when I found out this existed, I went and tried it out, and it was immediately clear it would meet my needs and go beyond. I've spent the latter half of the day tinkering with it, and updating the firmware. The drums out of the box are fantastic, and it's really fun and inspiring to learn new systems for sequencing and programming. The reverb and delay effects are decent, and being able to sequence them is a huge plus. The factory synth patches aren't great, in my opinion, but the synth engine seems fine and I'm hoping I'll quickly find replacements to get rid of the crazy acid- or dubstep-inspired sounds. I really don't love the accompanying software, though, and have found my first experience with it to be unnecessarily confusing. I just want to quickly trial new sounds and swap them with the old bad sounds! I also love that it's battery powered and that I wandered around my apartment working on sessions tonight. I would have never bought a device for that feature, but I really enjoyed having it. I admire your goal to tweak patches, but I'm hoping to get the thing set and then never tweak the innards of it again. I just want a simple set of synth patches with useful macros (high-pass and low-pass filter cutoff and resonance knobs, saturation, subtle bitcrushing/downsampling, etc.) and then to think of it as a hardware device forever after. But so far, I am really impressed with the Circuit, especially for the price point, and more than anything else, I really do find using it to be an inspiring experience. This editor works better for me than Novation’s in terms of synth patch editing. I think it has that immediacy you’re looking for, plus a lot of presets to use as starting points. Hey, thanks for this! I had no idea it existed. I'll take a look at it today. As a little test, I rigged up umpf Club Drums to spit out individual processed hits as samples to separate tracks. Then it was easy to slice and bounce these clips to a set of wav files, available to drag and drop into the Circuit sample slots in the Novation Components application. Note the two hits for each instrument, the first at full velocity and the second at a reduced velocity. Probably overkill considering the Circuit can handle velocity per hit, but fun to set up anyway. I just like the idea that getting processed sounds from Reason into the Circuit can be fairly painless. That's pretty cool! I spent every spare moment of the day noodling with the Circuit and really love this thing. So many well-considered touches to it, like being able to add in flams or triplets (or even just late notes), or easy panning in the mixer, or automating the effects. I'm honestly pretty satisfied with the basic drum sounds in there, though I'd of course prefer to swap out some of the weaker samples. That said, I feel no great urge to do it, and instead I want to spend all my time making sessions. I'm going to do some swapping out of some of the synth sounds, because I really feel some of the synth patches are weak or not at all for my tastes, but that will probably be it until I need some new inspiration. I'm excited to hook this thing up with my other hardware devices and Reason. I just need to stop wandering around the house with the Circuit first! You have any luck getting the Circuit to receive MIDI clock info from Reason? It should work automatically, but for whatever reason, the Circuit doesn't seem to receive clock. I've got the "send clock" button on in the "sync mode" section of the transport window in Reason, and the device is added to my MIDI controllers, AND another hardware device is receiving MIDI clock from Reason just fine. But for whatever reason, the Circuit isn't automatically finding the tempo information from Reason. Let me know if you've got it working! I'd like to get everything sync'ed up and playing together. Never mind, got it: Reason can only send MIDI clock to one device. That seems... I don't know, antiquated? All my current controllers are USB, and I don't have one of those USB MIDI hubs, so I dug up my old 5-pin MIDI keyboard controller and plugged directly in to the Circuit. Wow. Being able to play live on a real keyboard using the on-board Circuit (Nova) synths, without a computer anywhere in sight, was a fun treat. Using the Circuit as a one-stop shop in this way really shows off the power for live performance that can be had from one little box. A neat trick here is that a polyphonic patch with existing sequences can be simultaneously played from the keyboard without losing notes unless you exceed the 6-note limit on a single synth engine. What works really well is if the live keyboard is played an octave or two above (or below) the sequenced notes so there's no conflict. The more I use this, the more I'm thinking of picking up a second (probably used) unit to sync up and have even more samples, tracks, synth instances and sessions available. Apparently I wouldn't be the first to do this. Earlier today I was showing the Circuit to a friend who's a pop/dance music producer and after seeing it in person, now he wants to run out and buy one. He hasn't really liked any of the other grooveboxes he's seen, at least in any kind of reasonable price range, but I put the Circuit through its paces for him and he REALLY liked it. He liked how it was simple, yet deep and can be completely customized with samples and patches, even at that price. I pumped it through my studio monitors and he said, "Yep, I feel like I'm at the club. That's the sound." Hah, I've also been thinking about setting up a second unit, or maybe the Circuit Mono Station, or haha why not both!, to work in conjunction. Although I hooked it up last night with Reason, and my favourite analogue unit and reverb, and the combination was sublime. This little thing definitely plays well with others. And yeah, with either a keyboard or on the Circuit itself, it's fun to play at an octave above or below a sequenced pattern. And your friend is totally right: there are probably deeper options, and certainly more expensive ones, but it is incredibly fun and intuitive and has "the sound". It would be a fantastic live device, and with a two Circuits connected (with a Mono Station or Moog for good measure, hah! ), you could basically do a full set on stage, with "beat matching" and filtering of one session while preserving the other. I would have never bought a device like this for its portability, but I've played it more on batteries than plugged in. Today I took a 2hr ferry and it was awesome to pull the Circuit out and start building a track. Agree with all of the above. I’m going to really max out a single Circuit in terms of building out songs with a live set in mind, then probably add another one when I start really feeling track limitations. I had been looking at a MiniNova, but I’m having a more-than-satisfying experience with a dumb key controller driving the Circuit synths, especially as they are based on the Nova engine anyway. Now I’m thinking that 2xCircuits will give me even more versatility sound wise than a single Circuit and a separate dedicated single-engine synth. Ah, what a time to be making music, what with all these fun choices. Poor Reason is gathering dust the past few days, although I need start work on a remix of a vocal artist’s track this weekend so Circuit playtime will have to go on hold for a bit. I just checked out a bunch of YouTube videos and went to Novations website to check out the examples. I absolutely LOVE my BSII....after a lukewarm reception due to its (at first) neutral character I realized that it can be anything you want it to be. This might be a neat little performance box for me, as not only do I want to travel light but also avoid subjecting my vintage synths to the usually crappy power at most venues! The samplers are always the “face” of my productions, but with two 6-voice polysynths and a neat little drum machine mixed in with my MPC and one of my rack samplers I could probably just bring a Moog or the BSII for bassline duties and a pedal board for effects and have a really killer compact live system. I’ve been struggling between having the full studio track available as stems or as patterns on the samplers....or the flexibility of playing everything as sequences and recreating the bones of the song live. Circuit looks like it could be interesting in this regard! Yes, the combination of features the Circuit has at such a reasonable price is kind of unique. Want to use it as a synth (or two)? No problem. A multi-track pattern sequencer? Yep. A sample player? Sure. And of course, there's the drum machine aspect. The fact that it easily interfaces and syncs with other gear, and can even be played from a keyboard ... really stellar. I can imagine a scenario where you're using your Moog or Bass Station sounds, but also controlling a synth on the Circuit from the keyboard if you want for a whole new palette of polyphonic goodness. Everything is just so darned immediate and playable in real time. So, I was bad today. I couldn't resist. I was in a local music store browsing around and I saw a cheap used Circuit in a display case. How cheap? Well, less than half the current price of a new one. It's in mint condition, all the controls are working like new, checked all the I/Os and they work perfectly. I was going to wait until I completely blew out my first circuit with content, but A) it was there and B) it was cheap and C) I already have some ideas for mixing the content from 2 Circuits that I'm itching to try out. I updated the firmware and tested the two connected together, and everything works as expected with the configurable MIDI clock/note/cc/program change data. I can choose to sync or not sync any of those channels between the two. For one configuration, I could have parallel song content across two Circuits playing in sync for a total of 4 synth tracks and 8 sample/drum lanes. Another configuration, I could have large amounts of basic sequenced song material, mostly each song isolated to one or the other Circuit, and treat them as separate "decks" live with unique songs on each, allowing me to do creative transitions between them. But that scenario seems like I'd be under-utilizing what two Circuits can do together. There's a lot more to explore than just these two ideas, especially since I can pass CC information between them dynamically, allowing me to control Circuit B knob and other parameters from Circuit A and more. Nice! I’m jealous, and think you made a great decision. I confess I was also looking around for another unit, but alas nothing used came up. I did, however, spend hours toying around with the Circuit while waiting for / taking the ferry home. It continues to inspire! Jim, I’d only add to your comment that you shouldn’t expect too much from the synth in terms of tweakability (at least when you’re not plugged into a computer). The macro knobs are super useful and can be programmed to taste, but a lot of the preset macros leave a lot to be desired. Yeah, some of the presets are more noisemakers than anything, which is fine for some, I suppose. But since I tend to want to do more melodic stuff where the knobs don’t send me into weird territory all the time, making my own patches and assigning macros accordingly is a must. Wouldn’t it be something to have the modeling equivalent of a synth like The Legend (polyphony and all) embedded in a groovebox like this? Then again, I guess that’s why there’s a market for the Circuit Mono. If I program the circuit in the computer, can I make the macro knobs do what I want to new polysynth sounds? As in, make presets that are what I need for the tracks and then have the macros control whichever parameters are necessary for the evolution of the song? Yes! I’m not much of a fan of the official software, but you can absolutely do that. This is one of the big selling points for me. The ability to customize each knob to control up to 4 parameters of your own choosing in each custom patch means you can make the Circuit something uniquely yours in the sounds generation department. 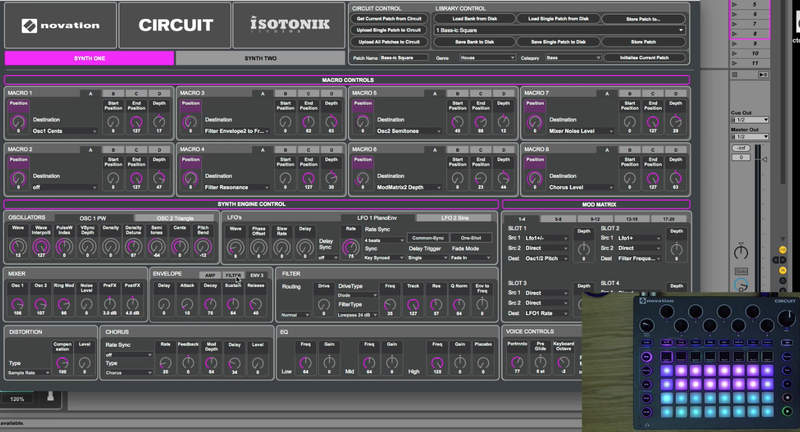 Check out the 8 macro (knob) slots in the Isotonik editor, all configurable. Okay, I'm now hitting a groove where it's fast and intuitive to combine sample flips, step-sequencing of parameter automation (EXTREMELY powerful), and real-time parameter automation. I can basically do anything I want with the sequencer/sampler combo, step by step or capturing sample triggering and knob-twists in real-time. So I'm now easily getting "full" sounding percussion arrangements out of only 4 lanes, and even baking in tonal content. For a lot of dance music, that's all you need for the main parts. Add a couple of synths into that mix and ... wow. Two Circuits may be overkill (for the moment) now that I'm REALLY coming to grips with this beast. That said, I DO have some more complex original music I'd like to adapt to Circuit arrangements, so having two will pay off there. Even with the more minimal electronica, I still like having two "decks" that I can load with material and crossfade back and forth. I saw a video of a guy using a Circuit and an Electribe, each with their own collections of songs. He was doing the same thing, treating them as synced "decks" for DJ-like crossfades from one to the other and back. Truth is, in that video, the Circuit stuff consistently sounded better than the Electribe stuff, so based on how my own Circuit material is turning out (beefy) and all the great material I'm hearing online, I'm looking forward to having enough material to give a live 2-Circuit performance a shot. Last edited by cognitive on 14 Aug 2018, edited 1 time in total. That dirty rumbly bass in "Stamp" is making me smile.